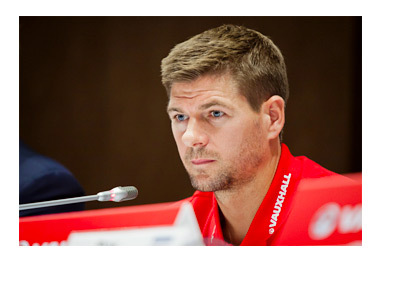 This is going to be a shorter piece because if you look around the web, from Barney Ronay at the Guardian to the lads at The Anfield Wrap, there's enough pieces out there to tell you about Stevie Gerrard and what he has produced in a red shirt. I never witnessed his debut, as I was too content to run around the living room in a cardboard cut-out of a car at the time, but it's safe to say that since he first stepped out on the pitch for Liverpool he's established himself as the ultimate hero for Liverpool fans across the world. His loss to the team is far more than that of a world-class player, it's the epitome of Liverpool. The reason that many supporters will have first watched the club over the last 16 years, and a key reason for so many people falling deeply in love with the club ever since. Let's face it, nobody falls in love with the football team that's getting battered from side-to-side regularly without a family tie or bond to bring you in the first place. But Gerrard would bring fans in from all over the world to witness one of the most dynamic and thoroughly enjoyable footballers of the history of the sport. His detractors would call this overblown sentiment for a player who hasn't been at his peak since 2008-09, but I can't even be bothered to dignity that with a response. Time, injuries and a club in a perennial decline since the Benitez era ended has contributed to Gerrard losing a bit of his old drive and quality. However, it still shines brightly in moments that make you realize just how much of a footballing colossus he has been for Liverpool. His trophy list is one of the most impressive in the sport yet many concentrate on the Premier League title missing from his collection. His list of accolades and personal achievements rank up there with the very best in his era, and eras that have come before. His goal scoring record in the big games has been excellent, even during the last four years when he's put up with constant barracking about being "finished". His renaissance last year stands out at one of the most outstanding runs of performances I've seen from a player who was on the scrap heap weeks beforehand. It's no exaggeration to say that whilst Liverpool have given Gerrard the platform to go out and perform, win trophies and place himself at the very pinnacle of the clubs history, the quality of the Liverpool captains performance over the years has more than paid the club back. Snide transfer jibs, slips and the rest - who can even muster the time to care anymore? When one of the city's own steps away from the armband and the club altogether for the foreseeable future, slips don't matter. Steven Gerrard steps away from Liverpool as the best player I - or you- will likely see in the shirt in our lives. From 2014 on, we might just have witnesses the last of the truly great Red legends. His passion and quality was infused by successful generations from the past that made him believe, that made him inspired - let's hope that the next great hope finds the same inspiration in a truly breathtaking individual.